The government of the Village of Phoenix consists of a five (5)-member board made up of the Mayor and four (4) Trustees who are elected to two-year terms. The board sets policy as well as adopting local laws, approving budgets, and setting tax rates. Members of the Board of Trustee have the responsibility for the management of all village property and finances. They are charged with the protection of all Village property and the safety, health, comfort and general welfare of Village residents. Village Trustees must see that personal property is protected, preserve the peace and good order, benefit trade and preserve and protect the public works system. The Board has a broad range of power that enables them to adopt a wide range of laws to address village concerns, so long as the action is not inconsistent with the constitution or the general laws of the state. Hello, my name is Paul Griser, a relatively new resident of the Phoenix community. My fiancé Ashley and I (and our Boxer Chevy) moved to the village last winter and quickly fell in love with our new community. Originally from Cape May, NJ, I moved to central New York in 2013 and have been employed at CiTi BOCES as a public relations specialist since 2014. To further immerse myself in the community and give back as much as I can, I decided to run and was successfully chosen as a village trustee. I would love nothing more than to give back to the community that has taken us in and turned us into Firebirds! David has been working for the Village of Phoenix several years as a Village Trustee/Deputy Mayor. 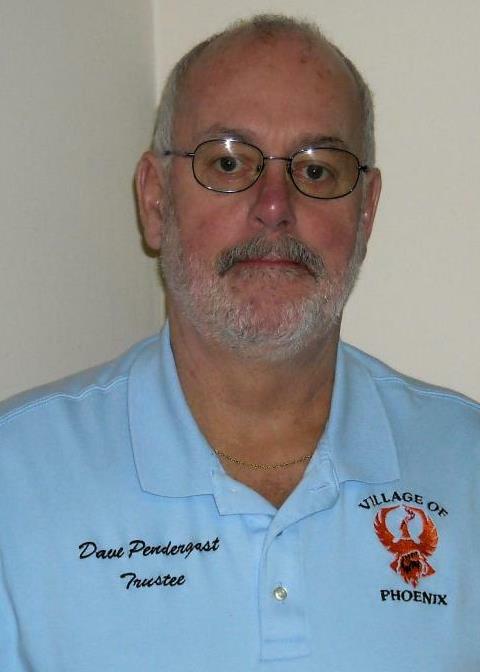 Dave Pendergast has been a resident of Phoenix all his life. He retired from the Town of Schroeppel Highway Department as a Medium Equipment Operator for 17 years. He has been married to Brenda for more than 30 years. They have two daughters Brandi and Jody. David enjoys camping and car races. Dave works closely with Phoenix’s Department of Public works (DPW), Code Enforcement, Village Administrator, and the Village Clerks. He regularly attends Village meetings, reviews the minutes from meetings, and analyzes expenditures. Dave truly cares about his community and the people that are in it. He wants people to be proud to say your Village is here for you. Any questions or comments, Dave can be reached at (315) 882-3409 or leave a message at the Village office.